During a recent twitter exchange, I was sent a document entitled "GMO Myths and Truths: An evidence-based examination of the claims made for the safety and efficacy of genetically modified crops". The document was sent to me as evidence that many scientists are opposed to GMOs. I will be reviewing this 123 page document in its current version (1.3b), in several parts. The document has three authors. The first author has a PhD in Molecular Genetics, is well published, and works on developing human gene therapies. The second author is an editor at GM Watch and a research director at Earth Open Source (who put together the document). The third author, has a PhD in molecular genetics, and is also the founder and CSO at a GMO testing and certification company. He is also the co-founder of Earth Open Source. Earth Open Source is an anti-GMO organization, whose website's main page includes the infamous "lumpy rat" pictures from Seralini's now-retracted article (for my views on the retraction of the study, please see here). I highlight the background of the authors to note that there are only 2 scientists, one of whom benefits financially from anti-GMO sentiments. The first section of the document outlines that although proponents of GMOs state that the genetic engineering process is just an extension of natural breeding, is safer than mutagenesis, and more precise than traditional cross-hybridization, it actually isn't. They admit that the genetic engineering process has become better and more precise, but you can still cause unintended consequences. They list a whole slew of unintended consequences that could happen. The word "could" is key in this section. Well, we've gotten better at a lot of different things over the past few decades. As mentioned, the authors admit that we've gotten better at creating transgenic crop, but they omit that we've gotten astronomically better at detecting unintended consequences. Technologies such as whole genome sequencing and microarrays are used because of the whole "we don't know what we don't know" phenomenon. These technologies will allow you to analyze RNA and DNA so that you can identify mutations that you didn't intend to make or RNA hybrids that you were unaware of. In a recent Q&A with the Arctic Apple company on GMO Skepti-Forum, Arctic Apple's staff mentioned that they had the genome of their apple sequenced (for a review of the Arctic Apple, please see here). All 750 million bases of it. And their conclusion was that there were no unintended mutations. So it's not surprising that in an online search, I was able to find out that companies such as Monsanto and Dow Agro use these technologies as well to study GMOs. There are a few segments on mutagenesis and cis-genesis in the document, and I've previously reviewed this topic here (briefly, cis-genesis is taking a gene from the same species and modifying it. Mutagenesis is using chemicals/radioactivity to modify a trait within a species. Plants derived through mutagenesis are not considered GMOs, but are lumped under "conventionally bred organisms"). The authors are of the opinion that these technologies are just as risky as transgenesis, and should be regulated and tested. My personal opinion on this topic is that the technology used to generate the trait shouldn't matter, and that the degree of regulation/testing should depend on the trait itself. Section 1 of the document boils down to a difference of opinion between these two authors and many other scientists. The authors conclude the first section stating that using genetic engineering to create new strains is unnecessary, because conventional breeding can meet crop breeding needs. Well, I'm not sure that's accurate, unless you discard transgenesis altogether, and I think that many scientists would disagree with this point of view. I feel that this whole section was like a side-by-side comparison of using a knife vs using a food processor, and then concluding that you don't need a food processor because the knife can do the same thing, but stressing all the additional risks when you use the food processor such as the possibility of getting electrocuted, shocked, etc. The document skipped over the benefits of the food processor and its strengths, and failed to highlight the drawbacks of a knife. Section 2 questions the idea of "substantial equivalence". I have to read all the papers that they're citing, so I'll leave that for another day. For now, Baby Boy is being weaned off his pacifier and he's not happy about it, so I've gotta boot. David vs Monsanto - Part 2 of "Patents and Seeds"
This is part 2 of a multi-part series on Patents and Seeds. Previously, I covered the basics, including agreements between farmers and seeds suppliers, as well as the Schwarzeneggar gene (i.e. Terminator). This week, I'll mostly be writing about lawsuits between farmers and the patent holders on seeds. According to Monsanto, they have never sued a farmer who has inadvertently used their seeds (this is a statement whose validity I'll explore throughout the series). They have, however, sued farmers who have allegedly replanted Monsanto seeds with knowledge of what they were doing. The most famous of these cases is against Canadian farmer Percy Schmeiser, whose story is now the subject of a documentary made by Journeyman Pictures "David versus Monsanto". This movie production company is also behind the documentary "Designer Babies & Gene Robbery", so I'm not sure how unbiased their productions may be. I actually watched a good chunk of the movie (which is just over 1 hour and freely available here) and my comments on it are below. Anyway, here's a summary of the case as best I could tell based on court documents (see Section II entitled "Salient Facts" in the Canadian Supreme Court Case and the Federal Court Case): Mr Schmeiser had been a farmer in Saskatchewan for over 50 years (if you haven't been, you should go. Saskatoon is lovely). He grew canola, among other crops. He saved seeds from a portion of his field every year for planting the following year. In the mid-90's, a bunch of his neighbours switched to Round-Up Ready (RR) canola. He never purchased a license to plant the crop. In 1998, testing revealed that >90% of his 1000 acres were Round-Up Ready. The Federal court case states that Mr Schmeiser did not deny the presence of GM canola on his field but he claims that he did not deliberately plant or deliberately cause the planting of the seeds (see paragraph 11 of the document). Mr Schmeiser additionally stated that he had suffered substantial damage and loss due to the GM canola, because his own strain that he had been developing over the course of many years got contaminated. Additionally, he argued that in order to have infringed upon the patent, he must have sprayed his fields with Round-Up, and he claims that he did not do this. Finally, Mr Schmeiser's defense team argued that by releasing the gene into the environment in an uncontrolled manner, Monsanto had lost or waived their rights to an exclusive patent. So Mr Schmeiser found out that there was Round-Up Ready growing on his field in 1997. He routinely sprayed the area around power-poles and ditches, and he noticed that a portion of the plants he had sprayed had survived the spraying, i.e. were Round-Up resistant (keep in mind that Round-Up is used to kill grass and plants - see previous post for more info on Round-Up). So he then conducted a test. He sprayed 3-4 acres of field along the roadside with Round-Up, and he noticed that about 60% of them survived, with a higher density along the roadside. This road is used by his neighbours for delivery/transport of canola seeds. He then used the seeds from that field, including the swath tested for Round-Up, to plant the following year's crop. Mr Schmeiser's canola was tested by a private firm who conducts random audits of canola crops. The farms are either identified by Monsanto among their licensed farmers, or they receive anonymous tips/complaints. The private firm received an anonymous tip from someone who claimed that Mr Schmeiser was growing Round-Up Ready canola, when he didn't have the license for it. Seriously... Wouldn't this make a fantastic whodunnit movie?? I can just imagine Clint Eastwood as Mr Schmeiser. And that anonymous tip would be left by someone who's face you can't see and is muffling their voice with a handkerchief, and later on in the trial you recognize the handkerchief sticking out of the Monsanto lawyer's pocket (played by Kevin Spacey). But the next-door neighbour also has the same handkerchief, so who was it??? But let's continue investigating this fascinating saga!! Between 1997-1998, a series of samples were taken and tested. Some were by court order, but the first series were just from road-side samples (allegedly taken without trespassing, although this is heavily contested in the documentary). The samples showed from 0-98% Round-up tolerant canola. In 1999, Mr Schmeiser was advised to buy new seeds, since the lawsuit had started. The judge in the Federal Court Case wrote that Mr Schmeiser's argument that Monsanto cannot control their patent/products defies all evidence, including the fact that Monsanto tests crops/fields, and removes "plants from fields of other farmers who complained of undesired spread of Roundup Ready canola to their fields." Two farmers testified that they had called Monsanto to have unwanted crops removed from their field, which had been done (in the documentary, Mr Schmeiser said that all the witnesses had been paid off by Monsanto). The judge also stated that Mr Schmeiser himself admitted to have kept seeds that had been shown to be Round-Up Resistant for replanting. The judge agreed with expert testimony that the wind/birds/bees alone would not account for the high concentration of GM crop found on the field, therefore, the patent had been infringed upon. He dismissed Mr Schmeiser's claim that in order for Monsanto's patent to be infringed upon, it would have required his fields to be sprayed with Round-up. When it came to the all-important topic of money, the judge took middle ground. He threw out Monsanto's claim for exemplary damages. Monsanto was also seeking $105,000 representing the profit that Mr Schmeiser made on Monsanto's seeds/patent. The judge said that this was too high and asked for Mr Schmeiser and Monsanto to agree to a mutually beneficial amount within a given time period. That's the Federal case. In the movie version that I'm writing in my mind, there's a fictional character (Mr Schmeiser's daughter) played by Emma Stone. She's a sassy, high-strung girl who always speaks her mind, and oddly enough, her lines in the movie sound a lot like my opinion. At some climactic point in the movie, she turns to her dad and says "Seriously Dad? You replanted those seeds and you're going to put up a fight? Why not just settle?? Do we really need this?" So what happened at the Supreme Court? The ruling was in favor of Monsanto, but when you read the court document, quite a few of the judges wrote partially in favor of Mr Schmeiser. The word "partially" is important here, because they didn't agree with all his arguments. The biggest issue that the judges had was whether or not higher life forms are patentable. Mr Schmeiser's team had argued that the patent was over the gene and the seed, not over the plant because plants are not patentable as higher life forms. Mr Schmeiser had ultimately "used" the canola plant and not the seed (at least I think that's what the court documents say... All this legalese is pretty new to me). A few of the Justices agreed with this argument, but not the majority. Ultimately, the majority of the Justices ruled that Mr Schmeiser had infringed on the patent by keeping and replanting the seed. To better understand Mr Schmeiser's point of view, I watched the documentary. Actually, I only watched 30 minutes of it, because so much of what was said contradicted the official court documents. Within the first 5 minutes, Mr Schmeiser says (I transcribed the following quote from the movie): "This is what the judge ruled. Number One: If you are contaminated against your wishes by Monsanto's GMOs, you no longer own your seeds or plants, they become the ownership of a corporation, in this case Monsanto. He also ruled we were not allowed to use our seeds or plants again. He also ruled that all our profit from our 1998 canola crop goes to Monsanto." Mr Schmeiser's point of view is that Round-Up resistant canola was introduced without much testing and that government officials were blinded by Monsanto's promise of better yields and more nutritious crops (which isn't factual, since Round-Up Ready's whole premise is that it is nutritionally equivalent). Mr Schmeiser also stated that he had developed his own strain of canola, which had taken him 50 years to develop, and that Monsanto's contamination of his fields destroyed all his work and effort (his claim to this unique strain was also in the Federal court case). I have to be honest: if you like conspiracy theories, you'll be drooling throughout this entire film. It's a goldmine. The documentary also interviewed a few other farmers, but I can't comment on their cases since I haven't read their court documents. There are quite a few misleading "facts" in the documentary. In the 30 minutes that I watched, not once did it mention that Mr Schmeiser had replanted the Round-Up Ready seeds with full knowledge of what they were. It makes you doubt the awesomeness of his own canola strain. In the court documents that I read, no where did it state that if a farmer's field is contaminated against his wishes, then the seeds/profits go to Monsanto. If this is in a separate court document or perhaps in a section of the proceedings that I glossed over, it would be great if someone could send it to me. The documentary fails to address the laws surrounding patents. The fact of the matter is that Monsanto's seeds are patented, and if you're a farmer and you don't like Monsanto's business practices, then you don't have to plant Monsanto's seeds. Well, I'm not sure how my movie would end. Maybe with a scene of Clint Eastwood staring over his field of canola and watching in despair as the wind from his neighbour's fields sweep towards his own? So, here's a thought, which I know many people out there also share. Monsanto has promised not to use its Terminator gene technology out of pressure from many groups. I understand that one of the arguments against Terminator technology is the fact that it would force farmers in developing nations to repurchase seeds, even if it's being used for subsistence farming. But most farmers in developed countries already buy new seeds every year, whether these seeds are genetically modified or not. So why not create a strain of genetically modified crops with Terminator technology and market it only in developed nations? Wouldn't this be easier for both farmers, those growing conventional crops as well as organic farmers? These would decrease the amount of "genetic contamination" and all the hassles that come with it for both sides, and improve the success of co-existence? What are your thoughts on this? So that's just a single case. For my next post on this topic, I'll keep exploring the topic of whether Monsanto has ever sued a farmer who inadvertently used their seeds. I can't sleep. It's 1:00AM, and instead of tossing and turning and keeping my husband awake, I've opted for exhausting myself by writing. This week's post is brought to you courtesy of Twitter. It all started when my twitter feed linked me to a doozy of a story, about how you can get E. coli poisoning from GMOs. The author outlines that E.coli is used during the course of genetic engineering to replicate DNA since it is highly prolific. But, the author highlights, it is also able to transfer DNA laterally to and from other species. Then the author says: "It is possible that a mutated form of e-coli resulting from the cloning process used in creating GMOs could get into the gut of a person or animal that eats a transgenic plant." The author then highlights that Dupont has partnered with the USDA in "identifying hard-to-identify strains of E.coli". The theory comes full circle with the statement: "with this convenient partnership, even if harmful strains of e-coli relating to GMOs are discovered, it is likely that the public will never hear it from the USDA or DuPont." I feel like the author of this post missed out on an opportunity to write for the X-files a few years back. I then spent two days with the individuals posting these articles trying to discover how this could happen, but it never when beyond "the YUK factor" of using E.coli in generating our food. I even offered a 1 hour tutorial to share information on E.coli's use in genetic engineering, which got turned down (I wonder how my previous customers would feel if they knew that I was offering consulting services FOR FREE on the interwebz). What I did notice was that there were a couple of comments that probably made great memes for someone which got retweeted a whole bunch of times. They were mostly about how our babies are being exposed to E.coli and how our GMO corn is contaminated with E.coli. YUK. To quote one of my colleagues, "my biggest concern is the unpredictability of evolutionary mutability, and the off-target effect of E. coli-mediated GMO excrutabilation likely resulting in contamination/Monsantinization of our 1.21 gigawatt-phase diarrhea chute." Doesn't make sense? Well, neither does the spontaneous mutation of E.coli from GMOs. Since my tutorial was turned down, I will write down a few facts about E.coli's use in genetic engineering here. E.coli is used in the lab specifically because the strain used IS NOT HARMFUL. The non-virulent nature of the bacteria isn't due to a mutation that might spontaneously arise to make it virulent again. There are entire genes that are different between virulent and non-virulent strains of E.coli. In fact, this paper that looked at 61 different strains of E.coli found that only 80% of their genomes are in common. That's much less than the >95% that we share in common with chimps. E.coli is used in the lab because it grows like crazy. When it replicates it also copies its DNA. If you add the DNA that you're interested in studying to E.coli's DNA, then that will also replicate. Why would you do this? Well, many procedures in the lab require a lot of DNA (by "a lot", I actually mean microgram or nanogram quantities. But for a molecular biologist, that's a lot). So how else can you get that much DNA that you're interested in? The issue of amplifying and copying DNA is not unique to the process of making GMOs. So the technique of adding/removing DNA from E.coli, also known as cloning, is very common. 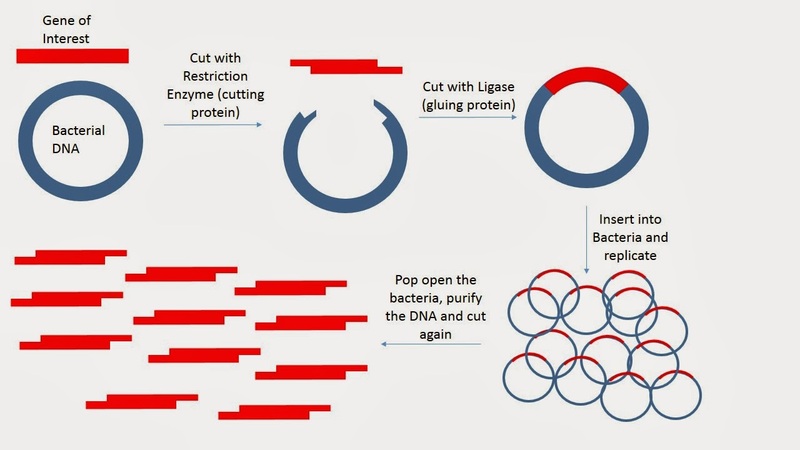 Here's an extremely simplistic overview of E.coli cloning: to add/remove DNA, you add an enzyme that cuts your gene of interest (enzyme is known as "restriction enzyme"). Then you purify the piece that was cut. The way that your gene was cut will be in a specific pattern, similar to that of a puzzle piece. Then, you cut the bacterial DNA with the same enzyme so that the two puzzle pieces will fit together. The pieces get "glued" together with yet another enzyme known as a "ligase". The glued piece of DNA goes into the bacteria, which then replicates. A few hours later... voila!! You have lots of bacteria that have lots of your DNA of interest. If you add DNA for entire genes to bacteria, sometimes they can actually produce that protein. This is the life-saving technology used to generate insulin, many synthetic vitamins, and drugs. In the case of insulin, the strain of bacteria used is E.coli. And despite my searches on the web, I've been unable to find a case of someone getting E.coli poisoning from insulin. Try telling a diabetic that there's a YUK factor when it comes to their insulin. So, today (which, at 4AM is actually yesterday) is International Women's Day and I'm going to end with a very personal comment here: To my fellow women. To all the brave moms out there doing their best, just like me. You do the groundbreaking women in science an immense disservice by willingly choosing to remain ignorant on a topic and then perpetuating erroneous information. We women in science do what we do only because there was a Rosalind Franklin and a Nettie Stevens who paved the way for us. And you're dropping shards of glass on that path. I kid you not. When you're up-in-arms about babies being exposed to E.coli through GMOs, you spread misinformation, perhaps even prey on the susceptibilities of other moms, and you perpetuate decade-old stereotypes about gender. The specific one I refer to is depicted in this oft-used clip from the Simpsons, where Mrs Lovejoy appears in town-hall meetings where progressive topics are addressed screaming "Think of the children!" and pulling her hair out. The specific stereotype I refer to is that we are emotionally driven creatures who sacrifice logic and common-sense when it comes to the safety of our children. Aren't we supposed to be helping each other out? Aren't we supposed to be part of a brighter generation of women who can be moms AND be smart? So why is it that you willingly turn down knowledge and choose to spew gibberish about how "GMOs are changing our evolution"? To paraphrase a recent interview I saw with Neil deGrasse Tyson, I can't blame you if you are unaware of scientific facts and truths. That is probably just a factor of the education system that exists today. However (and this part is my own opinion, not Dr. Tyson's), I can blame you if someone tries to correct you and educate you on these scientific truths and you choose to ignore them. So let me make this abundantly clear: there is NOTHING, let me repeat that: NOTHING, written in that article about the risks and dangers of E.coli's use in genetic engineering that is accurate. If you want to argue against GMOs, please use arguments that are evidence based and do not propagate scientific illiteracy. Think of the children! One of the common criticisms that I read about "Big Ag" is that our food should not be patented. This is the first in a multi-post series looking into the topic of intellectual property surrounding seeds. I have a few disclaimers here. First of all, there are very few scientific publications on the topic of seed patents. So most of my research was done reading the information from court cases, company websites, Wikipedia, and news sources. Second of all, I work for biotech companies who are able to make their profits and pay me due to patenting laws. As my husband says to the kid every morning when I leave the house "Mommy is going to go bring home the bacon" (on some joyous occasions, that's a figurative AND literal statement.... Mmmmmm... Bacon-topped meat loaf...). I am only able to do so because the companies I work for make unique products whose patents are vigorously protected and defended. Even when I went through grad school, we signed documents regarding patents (and how anything we discovered would be property of the University/Hospital). I work on products that take years to make, millions of dollars in investments, and countless hours of work from teams of researchers. To have that reverse engineered and remade elsewhere in a few months would be disrespectful to our work and disingenuous at best. As such, I believe that patents have a purpose, which is the same purpose as copyrights/patents on art, music, electronics, and software: to respect the work of its authors. But I agree with the President's statement at the State of the Union address, where he mentioned that patent laws need to be reformed, because frankly, some patents are just ridiculous (I was quite happy the Supreme Court ruled against the patenting of naturally occurring genes). With that in mind, let's investigate the topic of intellectual property surrounding seeds. I began by reading the Wikipedia entry on the International Union for the Protection of New Varieties of Plants (UPOV), as well as UPOV's website. This organization was established about 50 years ago with the express purpose of protecting new varieties of plants with Intellectual Property laws. The organization has a long list of member nations, including the US, Canada, Chile, and many nations in the EU. Interestingly, the plants protected under its laws are not only genetically modified plants, but also plants generated through traditional breeding (see previous post on this topic). In order to be granted breeder's rights, the plant variety must be new, distinct, and must be genetically stable and uniform (basically meaning that each seed should be genetically identical to the next). The breeder's rights are then protected through legislation in each member nation. Breeders can license their technology to other companies or institutions. There are also exemptions, including uses such as research and subsistence farming. My understanding of that is if I plant a few seeds in my backyard for my family and don't sell anything, then I'm not violating any laws. So I think you're in the clear if you plant seeds from the delicious butternut squash you bought at the grocery store. Before moving on, let me reiterate that GM seeds are not the only plants to have patents. Check out this database with a whole slew of patents, most of which are not transgenic plants. The patenting of seeds is much broader than just GM crops. Keep in mind that developing a novel traditionally bred plant also takes much research and trial/error. Pluots didn't just appear in a day :) During a trip to Singapore, we learned that they have research facilities dedicated to generating new orchid strains and that orchid sales are a major source of income to the nation, so decorative plants are also the result of biotech. Next question: how do breeders make their money if you can just replant seeds from one year to the next? Before I started writing FrankenFoodFacts, I had heard about Terminator Gene technology and had been under the impression that all genetically modified seeds used this technology. If you haven't heard about it, it's a seed from the future that returns to save the world from doom. Hilarious!! Actually, the gene that is modified in these crops makes the seeds sterile, so you would not be able to replant seeds from one year's crop to the next. It would effectively force farmers to repurchase seeds every year. If you search the interwebz, there's plenty of noise on how Monsanto is destroying the world with these seeds (see here and here). But the thing is that there is no commercially available crop with Terminator Gene technology. Monsanto's website states that they have made a commitment not to use this technology in food crops. Whether or not you believe their promise, the fact remains that they have not used it to date even though they've had the technology in their hands for over a decade. So instead of using Terminator Gene technology, Monsanto and its customers sign a contract called the "Monsanto Technology Stewardship Agreement" or MTSA (yeah... it's a pretty marketing-y name) and they obtain an annual license. Syngenta has a very similar agreement. As part of the agreement, you commit not to sell or distribute the product in regions where the product is not registered. You agree to follow all the directions and instructions for growing the product, particularly EPA restrictions. The document outlines that if Monsanto believes that a customer has retained seeds, the company will request all the appropriate documents to determine if new seeds were purchased. Monsanto also has the right to test and inspect a grower's field (although I'm not sure how this right is exercised if the suspected grower doesn't have a relationship with Monsanto... Maybe through a court order?). Bayer CropSciences website didn't have their method for licensing enforcement outlined, but agreements between farmers and Ag companies seem to be the norm. As far as I can tell (and unlike my cell-phone plan), farmers are not locked into a multi-year contract, so they can choose to plant a different vendor's seeds whenever they want (please ping me if I'm wrong). One really interesting thing I learned is that Monsanto customers who purchase crops that have the Bt trait have to plant an insect "refuge" (page 4 in the link). For an explanation on the Bt trait, please see previous posts or Wikipedia. Anyway, the insect refuge is a portion of the land that is planted with non-Bt crop. In the scenario where an insect has mutated to resist Bt and survives within the Bt-crop field, it will hopefully mate with a "normal" insect that is happily chomping away in the non-Bt portion of land. This will lead to baby-insects that are susceptible to Bt. Therefore, you don't end up with "super-insects" that might take over the land and reenact Starship Troopers. The next thing I wanted to learn about was the subject of lawsuits. Something that I've read time and over again is that Monsanto routinely sues farmers whose fields are contaminated with GMOs. But this is getting quite long, so you'll have to read part 2 next week.